A few weeks ago , I wrote about the potential for telcos to take advantage of digital transformation opportunities to boost industry growth. At present, much of what passes as digital transformation in the telco sector focuses on new technology (NFV, SDN, 5G etc.). This is understandable given the desire for innovators and vendors to sell new technologies that help service providers adopt more agile and flexible operational models. However, these ideas do not correspond to transformation in the sense of entering new markets or, of driving revenue growth in new service categories. NFV, SDN and 5G are more likely to lead to juggling between CapEx and OpEx budgets which will have an impact on profitability and depreciation financial metrics rather than driving top-line revenue growth. The Internet of Things (IoT) does have the potential to open up new growth markets and is starting to be recognized as an enabler for digital transformation. So, is there much evidence that will encourage telcos to enter completely new markets and drive meaningful revenue growth? What characterizes such opportunities and how should telcos approach them? If the telco industry is to profit from the digital transformation agenda, it needs to think of digital transformation as applying to more that its internal operations. Telcos need to propose solutions that help individuals and organizations in the wider economy to leverage digital technologies to meet their individual needs. Moreover, many businesses are looking for ways to leverage digital technologies to change their business operations. By addressing these needs, telcos stand to benefit from top-line revenue growth from higher consumption of traditional telco services and new demand for digital transportation services and service-enablers. Thus, successful telcos should see an uplift in revenue growth, including a contribution from new service categories. To illustrate the potential opportunities and challenges, consider the example of m-Pesa, the mobile money solution pioneered by Safaricom in Kenya. Now celebrating its tenth anniversary, m-Pesa represents about 25% of Safaricom’s total service revenues. Together with the more expected mobile data service, these two offerings dominate year-on-year revenue growth. Over the past 4 years, Safaricom grew top line revenues at an annual rate of 15%. Over this period, mPesa itself grew at an annual rate of 25.6% over this period. This is roughly the rate of growth that most industry analysts project for the IoT market. 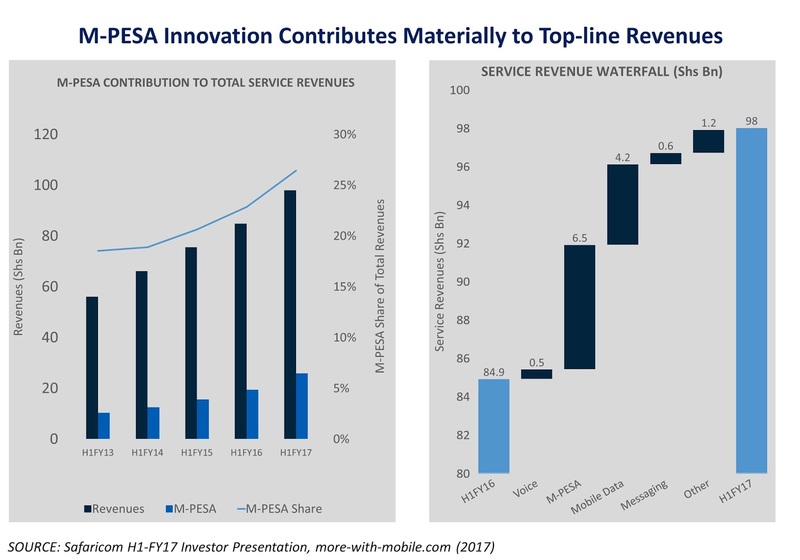 In the context of innovation management, mPesa’s growth is not the result of a one-off value proposition. From its early base as a system for money transfer within Kenya, Safaricom has progressively enhanced the offering by adding merchant payments and basic savings offerings to help consumers take the first step on the financial services ladder. These enhancements have increased the relevance of m-Pesa to everyday consumers while extending its reach into different parts of the Kenyan economy. The lessons from this experience are, firstly, that innovation in non-telco sectors can realistically contribute to telco growth. Secondly, innovators need to think ahead about service enhancements that can be built on top of the initial proposition to create long term sustainability. In the case of m-Pesa, a convenient way to transfer money has blossomed into an array of personal financial service offerings. Let’s hypothesize about how these ideas might apply to the connected car market and its roots in the field of vehicle telematics from the M2M era. 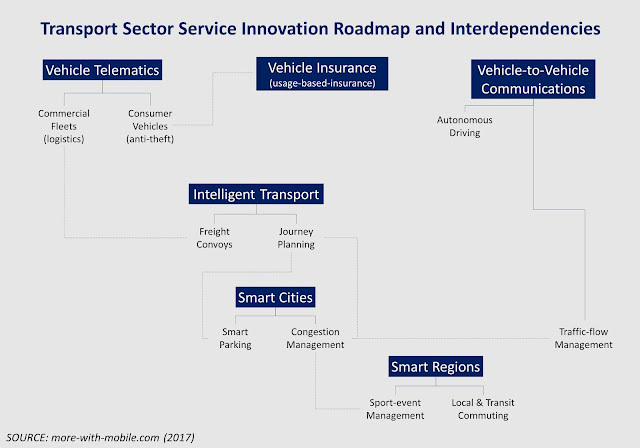 As illustrated below, telcos can plan within the context of a long-term services road-map, only some elements of which need to be addressed from day 1. Reading the illustration from the top-left, the initial proposition of connecting vehicles provides opportunities in the enterprise (fleet logistics) and consumer (anti-theft) segments. One extension in the consumer segment is usage-based insurance. Similarly, fleet management opens the door to freight convoy applications within the intelligent transport category. This category also includes journey planning which links to the smart cities market. Smart services expand into smart region applications, examples of which include event management for major entertainment and sporting events. Here, a large influx of spectators, many coming from far afield and having to negotiate congested roads with temporary road-diversion and car parking arrangements. This requires several city and inter-city transport agencies to cooperate with event managers to deliver an efficient transport solution with minimal impact on local residents. This road map of potential service innovations shows a fraction of the application possibilities. Beyond the individual (silo) applications, strategists and product managers can start to plan for new enabling technologies and commercial models, especially as much of the innovation that is required involves a considerable lead time. Telcos and established enterprises are in a difficult situation as far as the IoT is concerned. The new services and business models that the IoT enables requires both sets of organizations to explore new ideas outside their traditional operating boundaries. Eventually, they will have to initiate plans in non-core segments, perhaps several years before services are launched. For telcos, the challenge is to leverage mobile as a distribution platform and to commit to an innovation agenda that looks beyond today’s horizon of SIM subscriptions and connectivity. In the case of enterprises that supply complex machinery and sensors, the challenge is to explore opportunities beyond remotely monitored assets (for predictive maintenance and usage optimization) and new ways to share assets and the data they generate. Both types of organization also have to figure out how to adapt their organizational models. The dominant trends in today’s IoT market involve operational efficiency and asset management type solutions for business customers. However, there is a growing potential for consumer IoT applications in healthcare, smart home, intelligent transport and smart city situations. Can telcos create the right business and organizational incentives for their Enterprise and Consumer business units to collaborate? And, how will these units ultimately collaborate in public-private initiatives involving many more partners to deliver a portfolio of related services? Returning to the example of mPesa, there was a thought provoking speculation in one of my recent discussions about telco innovation. How would the mobile industry have developed if mobile operators had taken the long view and applied for financial services licenses 10-years ago? Following a successful venture into the world of banking in Poland, the Orange team has finally taken the bold step in its domestic market. Orange Bank will officially be available to employees from the beginning of May, and open to everyone else from July. In an industry which is driven by the holy grail of diversification, Orange are starting to put some space between itself and the rest of the peloton. In light of my closing comments above, it is interesting to see the CMO of Orange describe the arrival of credit services as a "once in a decade opportunity" to drive customer acquisition via Orange Bank. Safaricom is strategically positioning itself for the fortune where big data will form the bulk of revenue for telecommunication companies. Quote from the article - "Ambition is of course no guarantee of success, but to change fortunes you have to do something different. Some telcos are burying their head and waiting for the connected sandstorm to pass, whereas some as going out in search of the oasis". Singtel's information-communication technology operations, which includes cybersecurity, and its digital business segment together made up a quarter of the company's total revenue for the July-September period. "It is a confirmation [of the] momentum that we are seeing in our digital efforts," Chua told a press conference on Thursday. Perspectives from different operators on the topic of top-line growth and the challenges/opportunities from moving into adjacent-industry markets. Vodacom Group booked a 20 per cent increase on annual revenue from its mobile money operation across four markets. Mobile money services now contribute 13.8 per cent of revenue for Vodacom Group’s International Business unit.